Canine Peace of Mind is a dog training company based out of Chicago, IL. They offer exclusive lifestyle dog training services Nationwide using a unique style and behavioral approach. Owner Scott Harris spent years mastering his style and dog training philosophies. He was even mentored by the dog whisperer himself, Cesar Millan. After years working for other dog training companies, Scott finally realized what he wanted to do. “I get many calls from owners who want to focus on rehabilitation, my philosophy is to prevent the problems before dog’s reach that point,” Harris told us. When Scott approached us he already had a great concept that we could build upon; selling pre-trained dogs that adapt to lifestyle of their new owners. He hired us to brand and package his idea, then, take it to market. 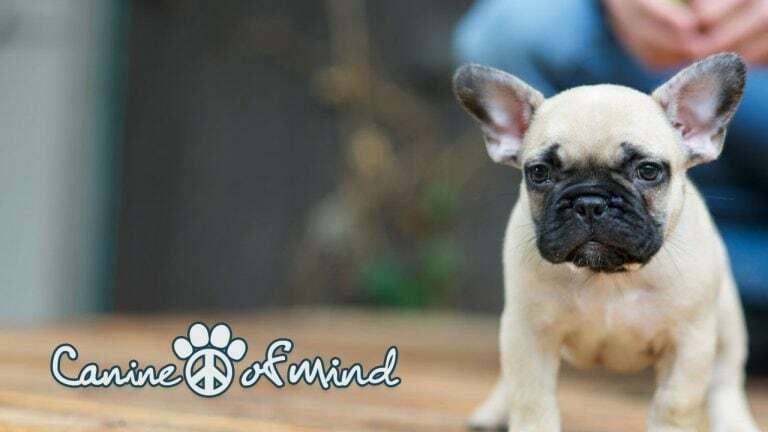 In 2013 Scott launched Canine Peace of Mind, an exclusive dog training company that offers a new and rare service among the pet industry; Puppy Raising (You Pick, We Raise) and Trained Lifestyle Puppies. 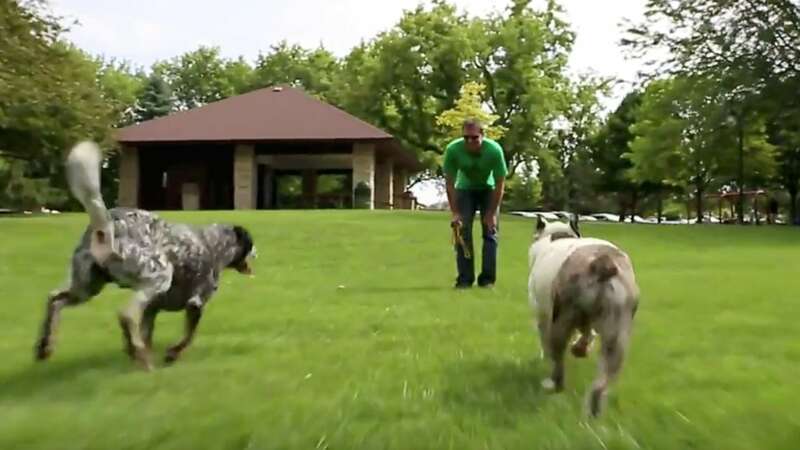 Harris is the first in his industry to offer a program where he raises puppies from the beginning stages of life then delivers them to their new owner fully-trained and ready to adapt to the owner’s lifestyle. Canine Peace of Mind has grown into an industry leader and nationally known brand. Sales have grown and the company regularly places trained puppies in the homes of new owners who happily pay $15,000 to $30,000 for their puppies. Scott Harris is now known as “The Puppy Guy” throughout the dog training industry and he is expanding to new locations and training new trainers to keep up with demand. Consonant Marketing helped Scott build Canine Peace of Mind’s brand from the ground up. Because we knew so much about the business, we could incorporate every element of the brand into the website early on. Scott gave us full creative control over the site’s development. We incorporated our logo design with images, video and written content that properly told the Canine Peace of Mind story to the website’s visitors. It was very important to pair Canine Peace of Mind’s exclusive style of dog training with a design that stood out from dog trainers, breeders and pet stores. Our goal was to design a “luxury brand” website that did not feel “cold” and contained friendly messaging. Clear, informative messaging was key to bridging the gap between giving visitors a “cold” luxury feeling and “cute puppy” experience. Together, we wrote clearly defined service pages that focused on Canine Peace of Mind’s approach and clearly demonstrated the value of owning a perfectly trained dog. To increase traffic, we edited and published blog posts written by Canine Peace of Mind’s staff that provided helpful information for all puppy owners. One of the posts was shared over 100,000 times. Canine Peace of Mind invented a new way for families to purchase a puppy. That said, we needed to target potential clients who were looking to purchase a new puppy, preferred a trained dog and were willing to spend over $10,000. We used broad search terms such as “Trained Dogs for Sale” and narrowed the keyword focus from there. Eventually, we targeted specific high-income communities and developed specific landing pages for visitors in those communities. We provided strategy, planning, production and promotion for Canine Peace of Mind’s initial launch. As a result, they experienced results that increased audience engagement and ultimately led to sales. 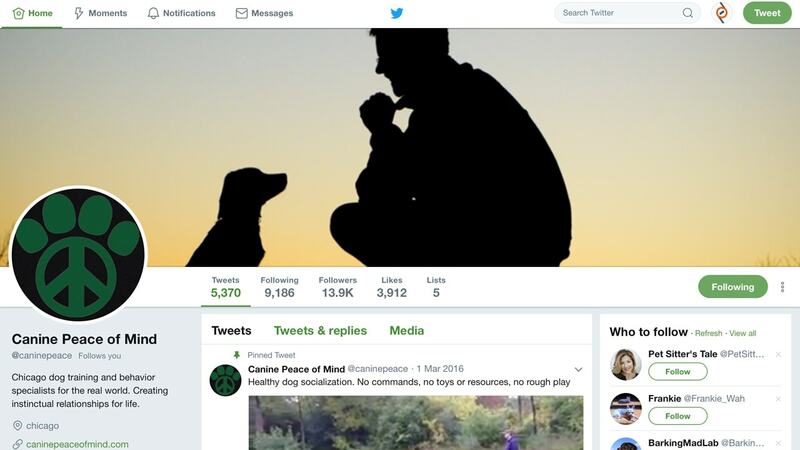 Building Canine Peace of Mind’s online presence and social profile required strategic social media campaigns and PPC advertising that targeted specific demographics. 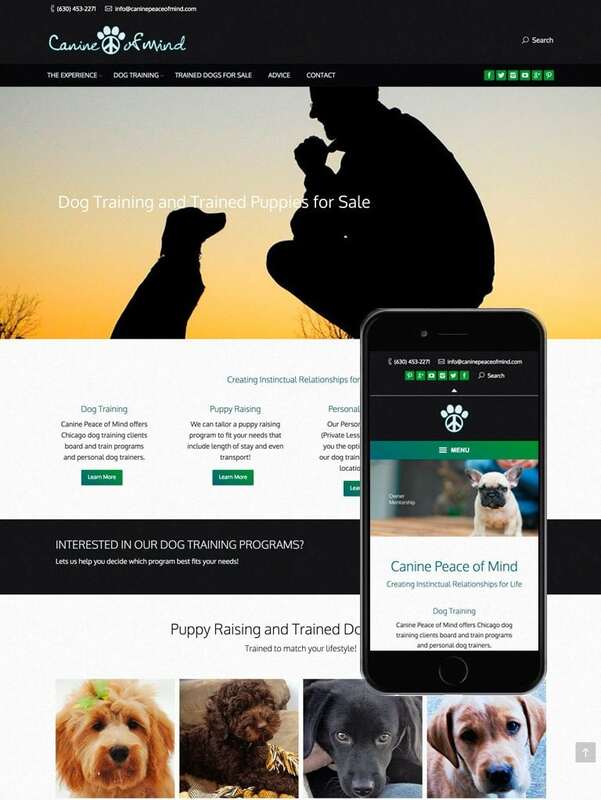 We aimed to grow brand recognition by providing informative content to potential buyers and provide current dog owners with valuable training information for the purpose of driving large amounts of traffic to the website. We grew a large social audience through keyword and interest targeting, sharing and retweeting relevant news, “liking” posts, staying updated on important trends within the industry, contributing Canine Peace of Mind’s own unique content and engaging with potential customers. Taking a new brand who offers a completely new service to market required advertising. We chose to run Pay-Per-Click (PPC) advertising to put Canine Peace of Mind’s brand at the top of search results for queries relevant to their industry and audience. This was a valuable tool that provided an immediate source of targeted traffic to Canine Peace of Mind’s website, drove conversions and contributed to revenue growth. 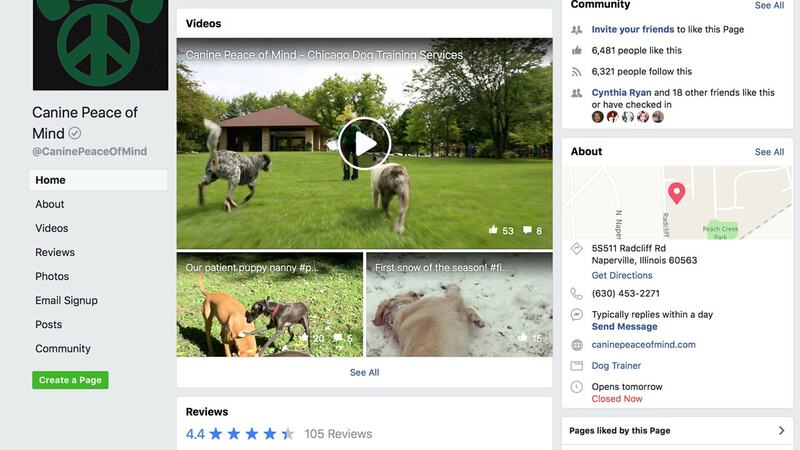 We produced and managed multiple Google and Facebook PPC advertising campaigns using local, regional and national targeting by interest, income and interests that coincided with Canine Peace of Mind’s target audience. Words alone will never capture the Canine Peace of Mind experience. Writing about owning perfectly trained dog does not produce the same effect as witnessing it with your own eyes. Video was necessary to properly portray Canine Peace of Mind’s message and demonstrate Scott’s personal training style. Our video strategy focused on helping Canine Peace of Mind inspire, entertain, and educate their target audience. We drafted interview questions and crafted storyline for two videos. One for Canine Peace of Mind’s board and train dog training services and one for the pre-trained puppies for sale. We provided Scott’s preferred video production company in Chicago with the outlines and communicated remotely during the editing process. Clips from the videos are now used for content marketing, new client proposals and video advertising. Canine Peace of Mind is listed throughout relevant business directories and service review platforms. We placed Canine Peace of Mind’s business profile and up-to-date information about the company in local online directories and national dog/pet industry forums. As a result, Canine Peace of Mind developed a stellar online reputation backed with glowing client testimonials.